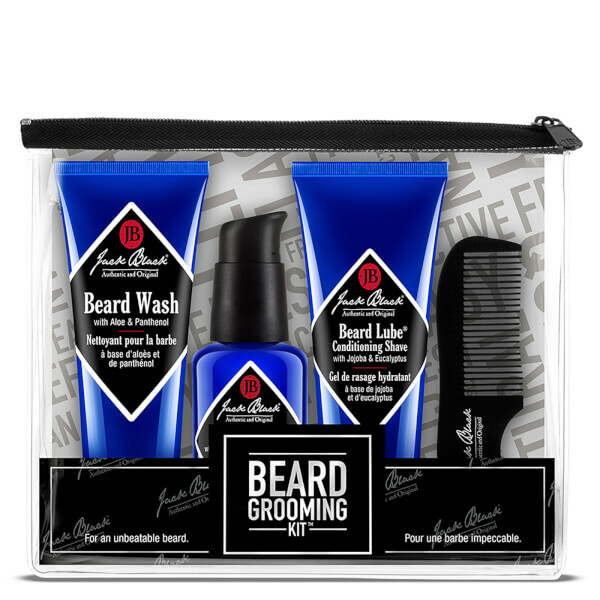 Look and feel your best with Jack Black's Beard Grooming Kit; a range of grooming products to leave your facial fuzz clean, tame and deeply moisturised. A revitalising formula that transforms into a rich lather upon contact with water to effectively cleanse and condition. Powered by soothing Aloe and Panthenol, the lightweight beard shampoo eliminates dirt, oil and product build-up, whilst strengthening and moisturising facial hair, and nourishing the skin beneath. Expect a well-groomed beard with natural shine. An ultra-hydrating formula that works to soften, moisturise and prevent razor nicks and cuts. Harnessing the powers of Jojoba Oil and Glycerin, the lubricating formula delivers the benefits of a pre-shave oil, shave cream and moisturiser in one, fuss-free product. It creates a protective cushion and allows your razor to glide seamlessly over skin without clogging the blade. Menthol and Eucalyptus leave skin feeling refreshed. A lightweight, deeply conditioning formula that works to soften and hydrate without greasy residue. Harnessing the powers of antioxidant-rich Brown Algae and Kalahari Melon Oil, the fast-absorbing oil combats frizz and dryness, whilst nourishing the skin beneath your beard for long-lasting comfort. Expect a smooth, tame beard with a dapper finish and natural shine. Beard Wash: Apply nickel-size amount to wet hands, work into lather, and massage into beard. Rinse. Beard Lube: Work a quarter-sized amount into your slightly moist beard every time you shave. Beard Oil: Pump 2-3 drops into your palm. Rub hands together and massage upward into facial hair, making contact with the skin underneath. Beard Wash: Aqua (Water), Lauryl Glucoside, Sodium C14-16 Olefin Sulfonate, Cocamidopropyl Betaine, PEG-120 Methyl Glucose Dioleate, Sodium Lauroyl Sarcosinate, Panthenol, Aloe Barbadensis Leaf Juice Powder, Glycerin, Butyrospermum Parkii (Shea) Butter, Helianthus Annuus (Sunflower) Seed Oil, Geranium Maculatum Oil, Rosmarinus Officinalis (Rosemary) Leaf Oil, Anthemis Nobilis Flower Oil, Hydrolyzed Jojoba Protein, Macrocystis Pyrifera (Kelp) Extract*, Camellia Sinensis Leaf Extract*, Ocimum Basilicum (Basil) Leaf Extract*, Punica Granatum Extract, Oryza Sativa (Rice) Bran Extract, Helianthus Annuus (Sunflower) Extract, Rosmarinus Officinalis (Rosemary) Leaf Extract, Citrus Grandis (Grapefruit) Fruit Extract, Hydrolyzed Linseed Extract, PEG-20 Methyl Glucose Sesquistearate, Glycol Stearate, Caprylic/Capric Triglyceride, Ethylhexylglycerin, Sodium Phytate, Polyquaternium-7, Tocopherol, Ascorbyl Palmitate, Retinyl Palmitate, Tocopheryl Acetate, Ascorbic Acid, Citric Acid, Phenoxyethanol, Chlorphenesin, Sodium Benzoate, Sorbic Acid, Citronellol, Geraniol. Beard Lube: Water (Aqua), Cetearyl Alcohol, Macadamia Ternifolia Seed Oil, Behentrimonium Methosulfate, Simmondsia Chinensis (Jojoba) Seed Oil, Hydrogenated Lecithin, Glycerin*, Mentha Piperita (Peppermint) Oil*, Menthol, Eucalyptus Globulus Leaf Oil*, Dimethicone, Phenyl Trimethicone, Calluna Vulgaris (Heather) Extract, Lecithin, Dimethiconol, Cyclopentasiloxane, Phenoxyethanol, Caprylyl Glycol, Caprylhydroxamic Acid. *Certified Organic. Beard Oil: Cyclopentasiloxane, Dimethiconol, Hydrogenated Ethylhexyl Olivate, Jojoba Esters, C12-15 Alkyl Benzoate, Vitis Vinifera (Grape) Seed Oil, Caprylic/Capric Triglyceride, Argania Spinosa Kernel Oil, Olea Europaea (Olive) Fruit Oil, Simmondsia Chinensis (Jojoba) Seed Oil, Hydrogenated Olive Oil Unsaponifiables, Oryza Sativa (Rice) Bran Oil, Butyrospermum Parkii (Shea) Butter, Citrullus Lanatus (Watermelon) Seed Oil, Tocopherol, Daucus Carota Sativa (Carrot) Root Extract, Rosmarinus Officinalis (Rosemary) Leaf Oil, Moringa Oleifera Seed Oil*, Sclerocarya Birrea Seed Oil*, Adansonia Digitata Seed Oil*, Schinziophyton Rautanenii Kernel Oil*, Helianthus Annuus (Sunflower) Seed Oil, Geranium Maculatum Oil, Prunus Insititia Seed Oil, Anthemis Nobilis Flower Oil, Fucus Vesiculosus Extract, Glycine Soja (Soybean) Oil, Beta-Carotene. *Certified Organic.